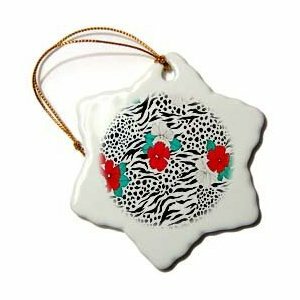 From the Lee Hiller collection this Rockabilly Hibicus on Black White Zebra Animal Print Ornament is measuring 3 inches. This Glossy Porcelain Snowflake Ornament is perfect gift for grandparents, aunts, uncles and friends. Commemorate each holiday season with a new ornament. Image is printed on both sides. Comes with the gold hanging cord. Lee Hiller considers herself as an “encouraging advocate” for planet earth. Her goal is getting people excited about reconnecting with Nature via her blog (HikeOurPlanet.com). Lee believes that once we see and feel our connection with the natural world it is inevitable we will want to protect our fragile environment.